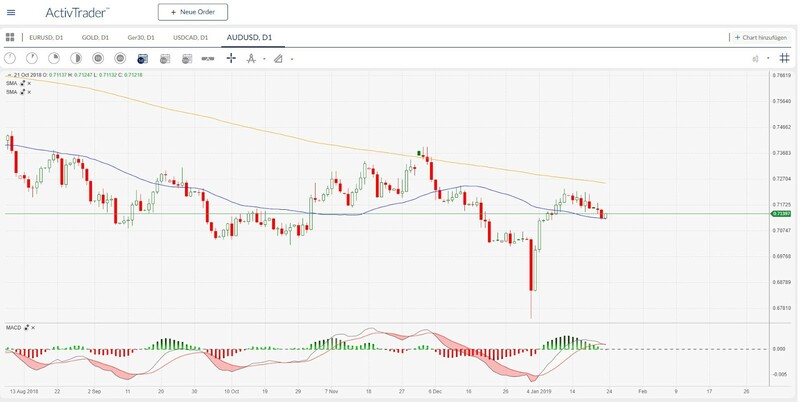 The Aussie (AUD/USD) fell well below the significant area of 0.7159 from late December 2016 in yesterday’s trading session. With yesterday’s candle, the market also entered the 0.7124 highs of Friday, January 4th. From a technical chart perspective, the market is still below its 200-day line. The area around 0.720 resisted the bulls, and the market was unable to break through to the upside. The MACD line is about to cross its trigger line heading downwards. One indicator that could show the market’s short-term direction is the 38-day line. With yesterday’s candle, the market has reached this line. If the market breaks through this area sustainably, this may mean that the bears could be strengthened in the short term. First support should be in the range of the smooth 0.7000. If the market breaks through this area, the next chart technical support lies at 0.6850. Looking at the chart, the picture for the Aussie has deteriorated. Should the 38-day line offer support to the market, the first resistance could be in the 200-day line range. If the market isn‘t conscientious, the next significant resistance is at 0.7360. Tomorrow at 0:30 a.m. (GMT), the employment figures for Australia, will be released.